The bestselling of Vietnam holiday packages has 4 World Natural and Cultural Heritage Sites: Charming Hanoi. Amazing Halong Bay, the top natural wonder of the world. Romantic Hue. Mysterious My Son. Exciting markets of Mekong river. All top destinations for Vietnam tour packages are stunning Sapa, Tamcoc, Halong bay - Best destinations for eco tours in Vietnam. Hanoi, Hue, Hoian are top destinations for culture holidays in Vietnam. 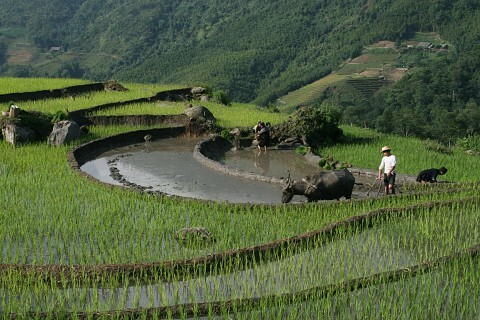 Only 12day Vietnam vacations, you can enjoy all the highlight of Vietnam holiday. All the best of Vietnam tour packages: Sapa, the colorful land of multi-cultural hill tribes, considered the Queen of natural beauty. Stunning Halong Bay, the king of all Vietnam vacations. Charming countrysides in Tam Coc. Perfume pagoda with perfect mix of pure nature and Buddhism. Peaceful and charming valley of Mai Chau. All will make your Vietnam holiday memorable. One of best Vietnam holiday packages offers a perfect balance of indoor Vietnam luxury travel service and outdoor adventure. This Vietnam vacation includes stunning landscapes and multi-cultural experience: Sapa - considered the Queen of stunning mountainous scenery. Halong Bay Tours are the king of all Vietnam holidays. Tam Coc, Cuc Phuong natural park, Mai Chau are all peaceful and charming. All will make your Vietnam holiday memorable. Vietnam beach holiday is the top luxury of Vietnam holiday packages with all the best vietnam beaches: Amazing Halong Bay, the top natural wonder of the world - with many small private beaches, offers luxury and romantic moment. China beach Vietnam in Danang, Hoian beach and Nha Trang Bay with golden sand beach all guarantee great time in your life.